Manual data entry is the bane of an end user’s existence — or at least their existence with the CRM. CRM strategies fail all the time for a number of reasons — usually several at once. Slow user adoption, insufficient technical expertise, a lack of managerial buy-in and guidance — the list goes on. Manual data entry — which creates an irritation both persistent and minor — contributes to this. It increases end user frustration, adds steps to a learning curve, and sets a higher requirement for data management (the absence of which could also undermine the CRM implementation in other ways). The last thing you want is your salespeople turning away from the CRM because they feel they work better without it. However, if your CRM system is so far gone that you’re willing to stomach disruption to find a new system, take heart — there’s a silver lining. You have an opportunity to find one that fulfills your requirements and placates end users, and you have some good options. Check below for a list of five solutions for sales automation that reduces manual data entry. Less manual data entry means more time for productive work, increased user adoption, and overall improved data health. Nutshell was designed with UX in mind, both in the product and the service. The system is simple to set up, the UI is quick and intuitive, essential functions are easily accessed and prominently displayed, the visual layout is attractive and easy to read. Functionally, Nutshell delivers as well. Users can build lead auto-assignment rules based on highly specific criteria, automate reminders and process-specific onboarding, customize dashboards and reports, track progress and quotas, and stay on top of your team’s performance. All this in a nutshell. Through it all, Nutshell provides free phone, live chat, and email support at a transparent price and integrates with a surprisingly diverse span of popular outside solutions. How It Reduces Manual Data Entry: Nutshell syncs with popular calendar apps and webmail clients. It offers a business card scanner in its mobile app, data import options ranging from spreadsheets to other CRMs, email templates, click-to-call, automatic logging, and other features aimed at reducing repetitive tasks. Starting Price: Nutshell’s subscriptions start as low as $19 per user/month, billed annually ($22 billed month-to-month). 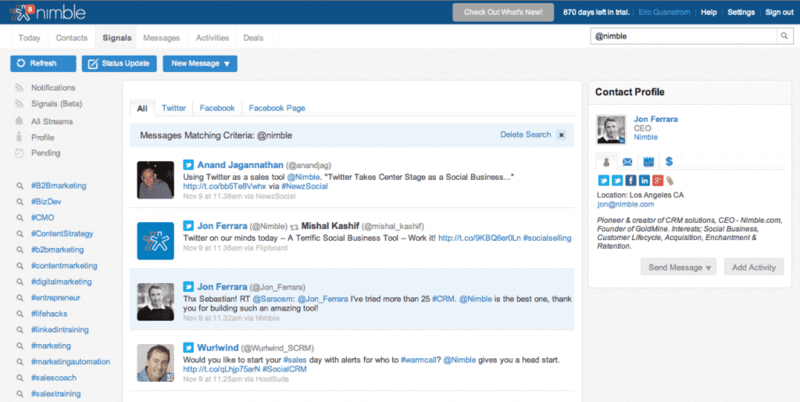 Nimble was the first true social CRM. It keeps a running feed of social interactions along with more typical contact touchpoints. Users can surface prospects on a multitude of social networks, segment contacts for bulk actions, tag leads for follow-up, manage the pipeline in a clean interface, and delegate tasks for other team members. Nimble’s Smart Contacts app — which is available as a mobile app or widget for browsers, email, and social networks — builds prospect’s live profiles in real-time, enables one-click imports and updates, relationship insights, and collaboration tools. The app works with Google Apps and Office 365 to add customer context to your email and calendar as well. How It Reduces Manual Data Entry: Nimble syncs email, contacts, and calendar with Google Apps and mobile devices. Auto-enrichment isn’t limited to contact profiles; Nimble also adds and maintains firmographic data like industry, size, location, employee count, revenue and more. Nimble offers a multitude of data import options ranging from spreadsheets, social media, and other CRMs. Starting Price: Nimble’s single subscription costs $22 per user/month, billed annually ($25 billed month-to-month). Base is an example of mobile CRM done right. Its web app offers a clean, efficient UI and short onboarding requirements. 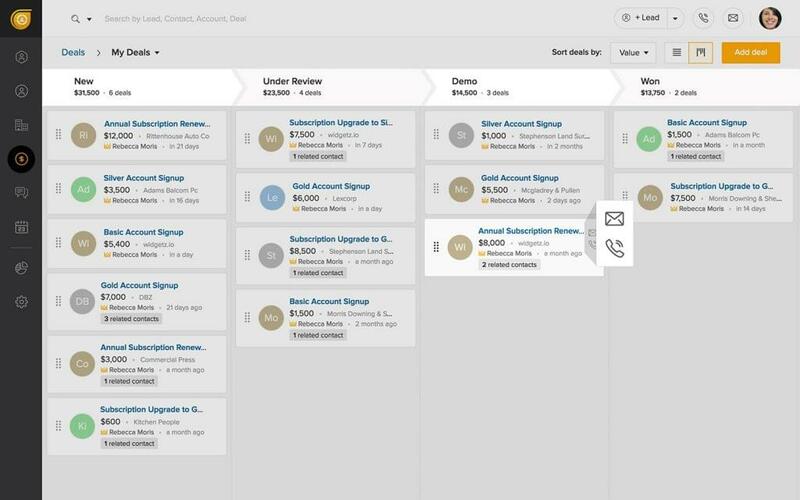 It also offers a host of features for sales enablement, including pipeline management, funnel tracking, predictive sales intelligence, and customizable dashboards. 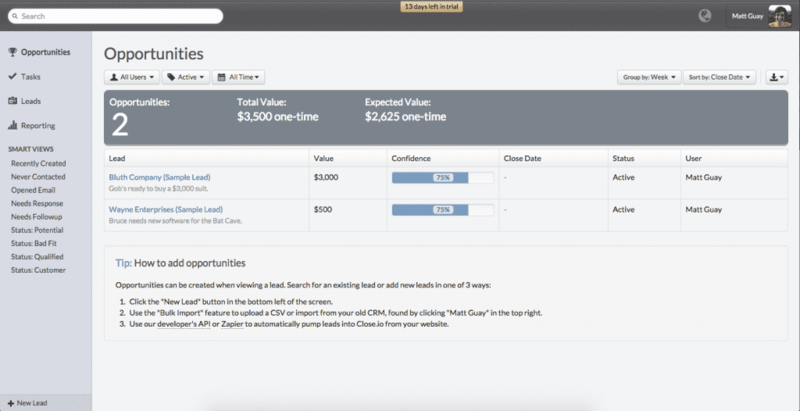 Base also provides management tools such as team performance analytics, funnel forecasting, and role-based permissions. Base’s mobile app is enhanced by geolocation to map territories and visualize routes; it also syncs with mobile devices to import contacts and call/SMS logs. Base offers additional features through add-on subscriptions to its Connect and Snap services; the former enables prospecting, lead nurturing and inside sales features, the latter extends the platform through native integrations. How It Reduces Manual Data Entry: Base offers email integration for Outlook and Gmail, and it sync with Google Contacts and Tasks. It reduces repetitive activities through task automation, automatic notifications, team document storage (for contracts and proposals). Its Connect add-on subscription further reduces data entry with personalized bulk emails, call logging, recording, click-to-dial, a power dialer, and call scripts. Starting Price: Base’s subscriptions start at $45 per user/month, billed annually. All subscriptions require a minimum of three seats. Contact directly for month-to-month billing options. Close.io is the quintessential inside sales solution: it’s tailored to fit the communication and workflow needs of sales conducted remotely over email, calls, and SMS. Close.io offers a web app and desktop client, both of which offer a simple and pristine UI and team activity transparency with essential functions only a click away. The system tracks communications and activities to provide comprehensive performance metrics for the sales team, individual agents, sales outreach by channel, and so on. Close.io boasts a finely-tuned search function with Smart Views — highly-specific yet intuitive search criteria — that can be saved for frequent searches. Its reporting provides effective high-level and granular insights, and it integrates with popular third-party software for productivity, customer support, and more. How It Reduces Manual Data Entry: Close.io provides email sync as well as automatic logging for calls and SMS, automatic organization of communications, tasks, documents, recordings, and notifications. Close.io also prioritizes opportunities that require attention. 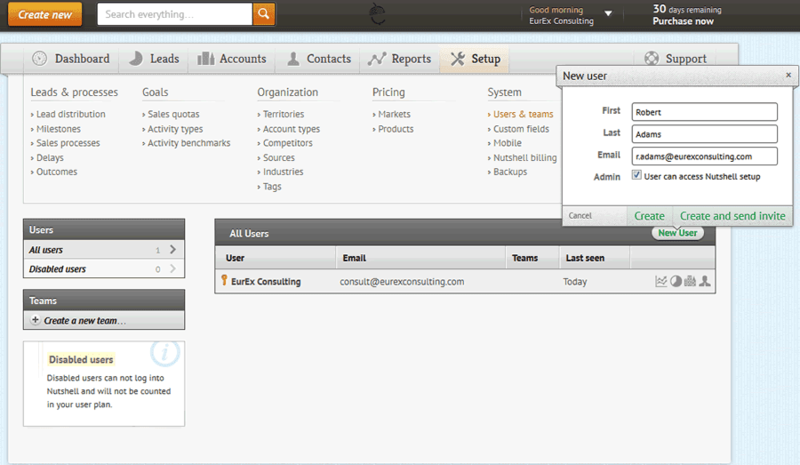 Upper-level subscriptions include bulk emails, call tracking, forwarding, and other attractive inside sales call features. Starting Price: Close.io’s subscriptions start at $59 per user/month, billed annually ($65 billed month-to-month). This price includes a phone number, VoIP service, and unlimited calling to various regions depending on the subscription. Freshsales is an excellent inside sales solution complemented with more conventional CRM functionality. The product is capable of email marketing outreach with bulk emails, templates, tracking, scheduling, and alerts. It offers automatic call logging, recording, and the ability to purchase toll-free or local numbers. Its paid plans include deal funnel and conversations views, while upper-level plans offer auto profile-enrichment, comprehensive lead scoring, website tracking, and territories. All plans offer role-based user permissions, standard reports, and a mobile app. 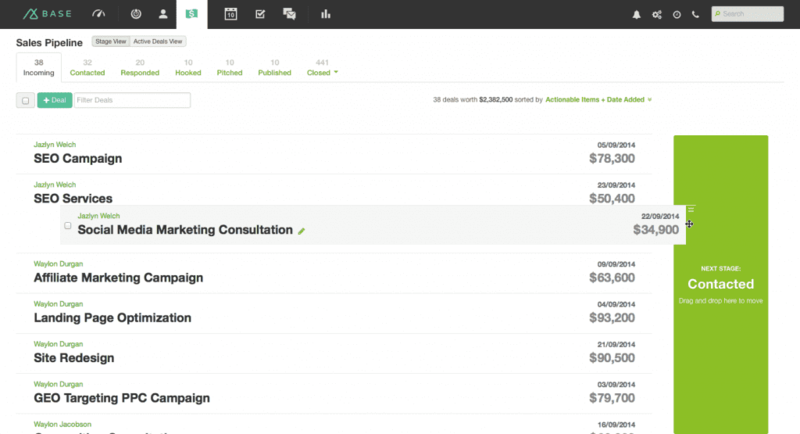 Freshsales also provides a team inbox for collaboration. Freshsales is part of the Freshworks suite, which includes Freshdesk for customer service; naturally, integration with its sister software is seamless. 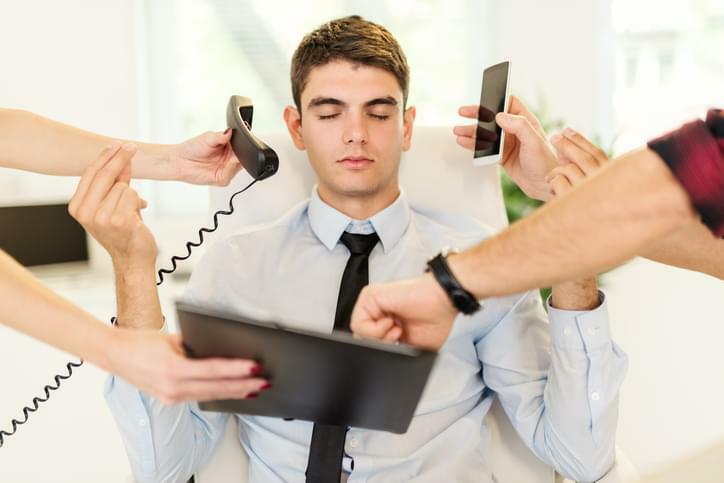 How It Reduces Manual Data Entry: Freshsales’ email sync, automatic call logging, profile auto-enrichment, and web-to-lead capture (for upper level plans) translate into time saved for end users. Paid subscriptions allow integration with Google Calendar to import events. Seamless interaction with other Freshworks products also alleviates considerable burden on end users. Starting Price: Freshsales offers a basic free version for up to 10 users. Paid subscriptions start at $12 per user/month billed annually, or $15 month-to-month. All plans, including the free one, offer 24×7 email support and 24×5 phone support. However frustrating, manual data entry doesn’t make or break a CRM system. Meanwhile, proper data management can mitigate many of the pitfalls of manual data entry, if not the frustration. 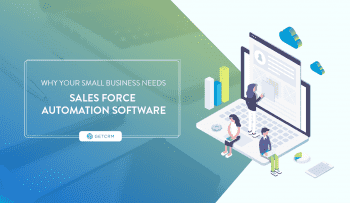 Companies with fairly simple sales and business processes struggling with a complex system might consider ditching their enterprise CRM in favor of a niche solution catering closer to their use case. Think your solution should be on this list? 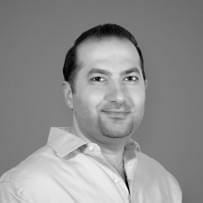 Reach out to the author at chris@getcrm.com. Need a few more ideas for sales automation solutions? Check out our guide.